Finally a decent knife to honor the great Daniel Boone, the most legendary frontiersman in American history. You've been waiting for that one, right? It makes you want to go back to the days of the Old West and see some gun-slinging action, maybe throw back a pint at the local saloon, or take off on your horse and explore the great outdoors. This gorgeous knife has a Bowie blade that measures 8.375 inches long. It's made from 440 stainless steel and beautifully polished for display. On the steel guard below the blade, the initials D.B. are engraved in cursive to commemorate the original owner. The handle is equally traditional, since it's made from solid walnut. Three brass fittings secure the handle to the rest of the blade. The one in the center is a brass star. A genuine premium leather sheath is included as well, complete with traditional western fringe around the edge. 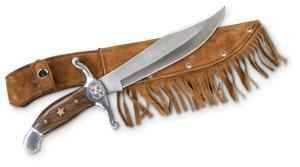 The original Daniel Boone knife has been kept in his family for generations, and only recently has the family agreed to share the wealth with others via this accurate reproduction knife. So for those that understand this knife's historical significance, it would be one heck of a great Christmas gift! For those that like to take things a step further, you can even have the recipient's initials engraved into the knife too.